Compact crossovers like the trend-setting Toyota RAV4 are tailor-made for the family on the go with spacious, family-friendly designs, power-packed and fuel-efficient engine options, innovative technology and athletic style cues. With the debut of the next-generation 2019 Toyota RAV4, the options are even better and the redesigned Toyota RAV4 promises to stand out from its competitors in this 2019 Toyota RAV4 vs 2019 Mazda CX-5 comparison. Back and better than ever, the 2019 Toyota RAV4 is available in five grades – LE, XLE, XLE Premium, Adventure and Limited – that can be tailored to fit your family’s lifestyle. Toyota RAV4 entries make room for five passengers in a cabin that possesses 98.9 cubic feet of passenger space and adds a cavernous 37.6 cubic feet of cargo space behind the rear seats that will expand to 69.8 cubic feet with the second-row seats laid flat – numbers that the Mazda CX-5 cannot match. What Are the Differences Between the 2019 Toyota RAV4 and 2019 Mazda CX-5? 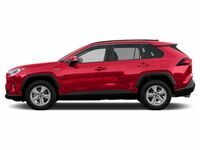 Armed with an affordable price tag, a long list of standard features, more cargo space, better fuel economy and an athletic style, the next-generation Toyota RAV4 will come out on top in this 2019 Toyota RAV4 vs 2019 Mazda CX-5 comparison. 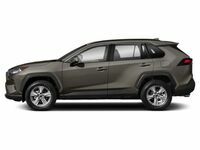 Base Toyota RAV4 LE trim levels will start at just $25,500 and will feature 17-inch steel wheels, Multi-LED headlights, a rearview camera, a 4.2-inch Multi-Information Display, remote keyless entry, power windows and a 7-inch Toyota Entune™ 3.0 touchscreen infotainment system with access to Apple CarPlay and onboard Wi-Fi. To cater to the family on the go, all 2019 Toyota RAV4 entries come standard with Toyota Safety Sense™ 2.0 technology that includes a Pre-Collision System with Pedestrian Detection, Dynamic Radar Cruise Control, Lane Departure Alert with Steering Assist, Automatic High Beams, Lane Tracing Assist and Road Sign Assist. 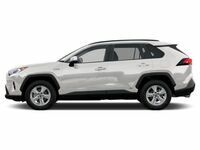 Upgrades to the Toyota RAV4 spec sheet include premium Toyota SofTex® upholstery, a 7-inch Multi-Information Display, heated and cooled front seats, a heated steering wheel, Toyota Smart Key® with push-button start, a power liftgate, a power sunroof and an 8-inch Toyota Entune™ 3.0 touchscreen with navigation. Toyota RAV4 entries will deliver an impeccable, all-around performance with a 203-horsepower 2.5-liter Dynamic Force four-cylinder engine that is paired with a Direct Shift eight-speed automatic transmission. With this powertrain under the hood, the front-wheel drive Toyota RAV4 will make 26 mpg in the city and 35 mpg on the highway – front-wheel drive Mazda CX-5 models make a lackluster 25 mpg in the city and 31 mpg on the highway. To upgrade performance, the Toyota RAV4 will add Dynamic Torque Vectoring AWD with Rear Driveline Disconnect and a Multi-Terrain Select system. Families who desire a fuel-efficient drive can upgrade to the Toyota RAV4 Hybrid. Armed with a 2.5-liter Toyota Hybrid System II, the RAV4 Hybrid employs a high-torque electric motor to make 219 total horsepower. Paired with a Continuously Variable Transmission, the Toyota RAV4 Hybrid will achieve 41 mpg in the city and 37 mpg on the highway – numbers the Mazda CX-5 cannot match. Mazda CX-5 editions are available with a more powerful 227-horsepower 2.5-liter SKYACTIV®-G turbocharged four-cylinder engine. Visit Downeast Toyota today to get behind the wheel of the next-generation 2019 Toyota RAV4!